Weighty Matters: Old school exergaming - actual running: Mickey's Mouse-ke-TAG review. Old school exergaming - actual running: Mickey's Mouse-ke-TAG review. So the folks from Wild Planet were kind enough to send me a few of their kids games and the one that caught my fancy was Mouse-ke-TAG. Unlike the Wii, Mouse-ke-TAG has kids running all over the house. Very simple to play. There are 4 Disney characters with embedded RFID chips. 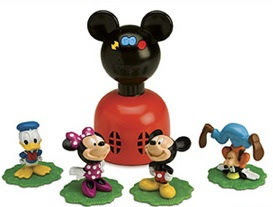 Scatter these over a room or home and then set the kids loose with Mickey's Playhouse with embedded RFID reader. The Playhouse recognizes the characters when placed on top and tells the kids through clues which character to look for. You can play different ways too. My kids (5 and 2.5) liked it best when they were on the timed mode and they had to run as fast as they could back and forth between characters. They probably were running around for a good half hour. Great game for a rainy day, snowy day or just an indoor day and supports up to 6 players. Not sure how much fun it'd be for just one child to play but get a bunch together and this may well run them tired. My only complaint? The characters fall of their bases too easily. I'd recommend gluing them down. For ages 2 and up (the box says 3 but my 2.5 year old had no issues).